Can a power supply be a collector's item? 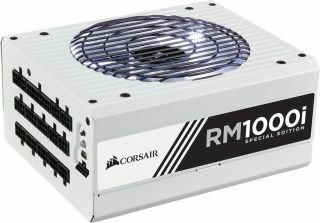 Corsair seems to think it can, so it's making available a limited number of special edition RM1000i model 1,000W power supplies to celebrate a pair of milestones: 10 years in the PSU business and having sold its ten millionth unit. Corsair put the achievement into perspective with some interesting comparisons and measurements. "With over ten million Corsair PSUs sold to customers around the world, Corsair has crunched the numbers to visualize this landmark. With every unit at full load, ten million PSUs could output more than 650 Megawatts; enough to power three Nimitz class aircraft carriers. What’s more, the combined length of all the cabling from ten million PSUs is enough to fully circle the globe (with 4,000 miles to spare). And the weight of ten million PSUs? Equivalent to four Eiffel Towers, 113 Statues of Liberty or 10,000 Asian Elephants!," Corsair said. There's a full infographic with all kinds of oddball stats available to view here, if you're interested. Only 100 of the limited edition PSUs will be made, each one individually numbered on a little badge on its backside. Kudos to whoever ends up with No. 1, which if we had to guess will probably be a Corsair employee or close friend of one. Other than being numbered, what makes this version of the RM1000i unique is that it's been repainted with an arctic white color scheme and a white LED 120mm fan. It's a fancy finish that would look right at home in an all white PC build, or as a nice contrast to a blacked-themed build. Either way, it retains all of the features of the non-special edition model, including fully modular cables, 80 Plus Gold certification, and 100 percent Japanese 105C capacitors. You can also toggle between the default multi +12V rail setting or single-rail operation. The PSU is in stock now at Corsair for $200. It's backed by a 10-year warranty.